Heat oil in a large stockpot over medium heat. Stir in the onion, carrots, and celery; cook and stir for 2 minutes. 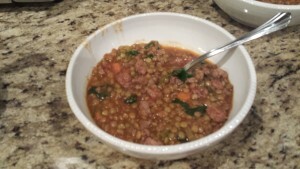 Add browned ground sausage, chicken broth, tomatoes, garlic, lentils, and bay leaves and bring to a boil. Reduce heat and simmer for 2 hours. Season to taste with salt and pepper. Add in spinach right before serving. Ooh! That will work on my sugar/grain detox I just started today!